Before you scour the words in this new model test drive for what the word Kadjar means, it doesn’t seem to mean anything – it’s just a name hatched up by those creative marketing types. You know – the people who came up with oddball names for other Renault new cars such as Twizy, Zoe, Twingo and Clio. There you have it – now we all you know. 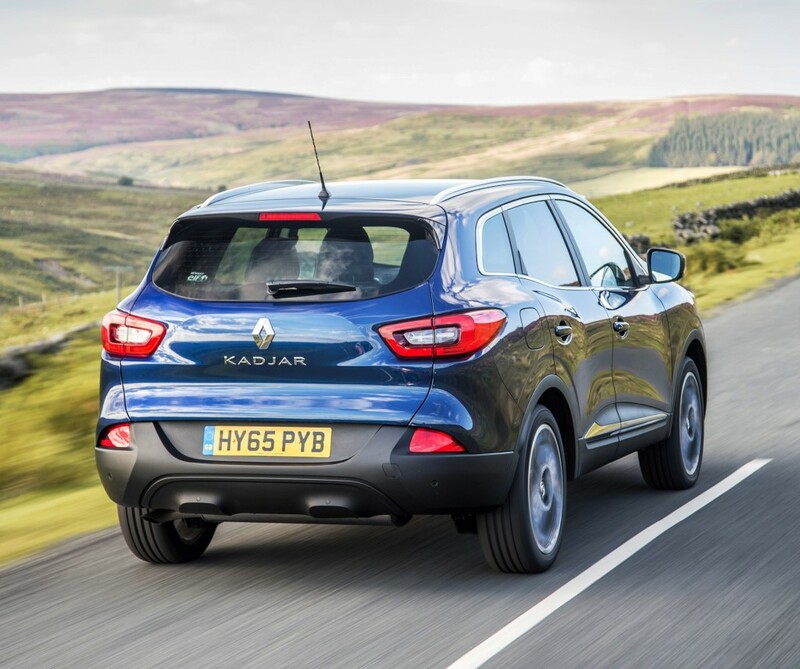 Want to know more about the Kadjar? Well it’s Renault’s answer to their alliance partner’s Nissan Qashqai, the vehicle that probably started the modern-day craze for Crossovers. The Qashqai remains the UK’s best selling model range in the Crossover sector. Such vehicles have been a huge global sales success story with one in five new cars sold being a Crossover. They are vehicle types that mix SUV styling with higher ground clearance, elements of MPV versatile seating combinations and fuel efficiency almost as frugal as medium-sized family hatchbacks. These two or four wheel drive Crossovers come in small, medium and large sizes and the Kadjar, like the Qashqai, is in the C-segment, or lower medium, as it is known. The Kadjar is built on the Nissan-Renault Alliance CMF platform. This is the same as used for the Qashqai but the Kadjar is built in Palencia Spain, not the UK which is home of Nissan Qashqai and Juke Crossover production. The Kadjar also uses around two-thirds of the same components as the Qashqai. In the UK there is an 18-model Kadjar range offering the choice of three engines, two gearbox options, four trim levels and two or four wheel drive versions. Prices start at £17,995 and range up to £26,295. The mid range 1.5 dCi 130 turbodiesel 2WD Dynamique Nav will likely be the best seller and costs £22,795. The engines on offer are all turbocharged starting with the 1.2 TCe 130hp direct injection petrol, the 1.5 dCi 110hp diesel and the 1.6 dCi 130 diesel. An auto gearbox option is available with the dCi 110hp diesel unit and 4WD is offered as well as 2WD on the top three spec levels with the 130hp diesel engine. Combined Cycle fuel economy, depending on the engine, ranges from 48.7 mpg to 74.3 mpg, CO2 emissions from 99g/km up to 130g/km, for company car drivers Benefit-in-Kind tax is 17 to 23% and insurance groups vary from 14E to 18E. The specification levels, depending on the engine chosen, are Expression+, Dynamique Nav, Dynamique S Nav and Signature Nav. Comparing prices versus the Qashqai, the Kadjar is marginally cheaper and specification a shade higher but as we know it is the real-life transaction price offered by the franchised dealers that really counts. With over 80% of customers using a finance package to buy a new car the monthly repayment or PCP contract purchase rate will also be a deciding factor as will running costs and the warranty cover. Here the Kadjar is the clear winner with its four years/100,000 miles versus the Qashqai’s three years/60,000 miles. When it comes to which one is the best performer, there is nothing really significant between them and in the end the choice will be down to price and which dealer the customer prefers. This is a really important point where I would advise customers to compare and try both offerings and take a careful look at the finance deals before they buy. Just to muddy the waters there is a wide choice of other C-segment Crossover models which should be considered and these include the Ford Kuga, Mazda CX-3, Peugeot 3008, new Honda HR-V, Kia Sportage and the new Hyundai Tucson. Renault sent me the Kadjar test car in the £24,795 top level Signature Nav spec but with 2WD and powered by the 1.6-litre 130hp turbodiesel engine. This develops 320Nm of torque from 1,750rpm and has a six-speed manual gearbox. For those wanting 4WD this would add £1,500 to the price. 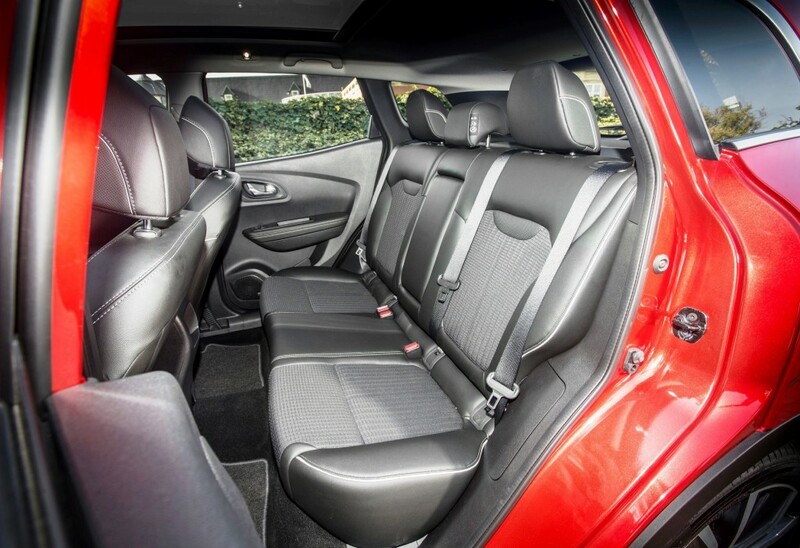 Of course there are still more extra cost options and packs that can be selected and these include automatic parking at £500 and the premium leather pack including heated front seats at £1,250. 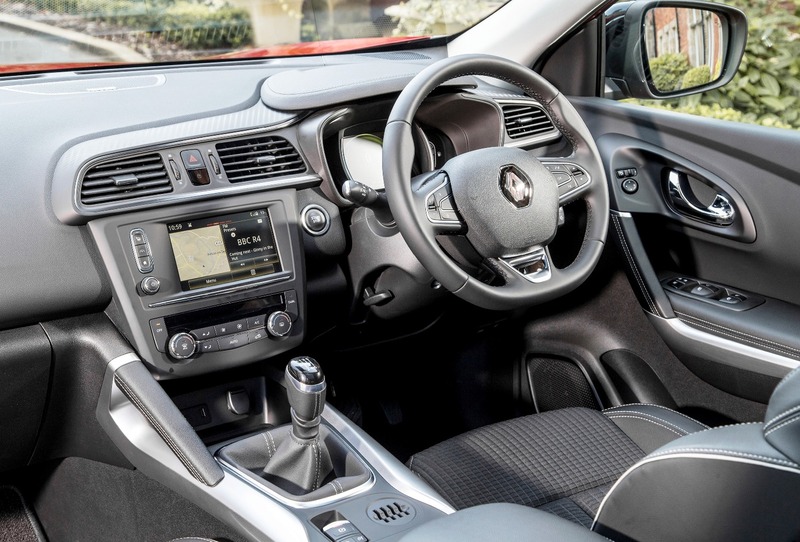 Core spec items for the Kadjar includes ABS braking, stability control, hill start assist, cruise control, ECO mode selector, tyre inflation kit, air conditioning, 60/40 split folding rear seats, 16-inch wheels, LED daytime running lights DAB radio, Bluetooth and a 7.0-inch digital dashboard display. The top level Signature Nav additions include automatic dual zone air con, automatic lights and wipers, cornering lights, leather and cloth upholstery, electrically adjustable driver’s seat, multi position boot floor, one touch folding rear seats, front and rear parking sensors, sat-nav, TomTom live real time traffic and data services, BOSE seven-speaker sound system, lane departure warning, traffic sign recognition, automatic high/low beam lights, LED headlights, panoramic sunroof, 19-inch alloy wheels, roof rails and front and rear skid plates. Styling wise the five door, five seater Kadjar has similar body lines to the Qashqai but it is brand-similar to Renault’s popular Captur compact five-door Crossover. It has a bold front end, large wheels fit the raised wheelarches nicely and there is a rising waistline and coupe roof line side profile. 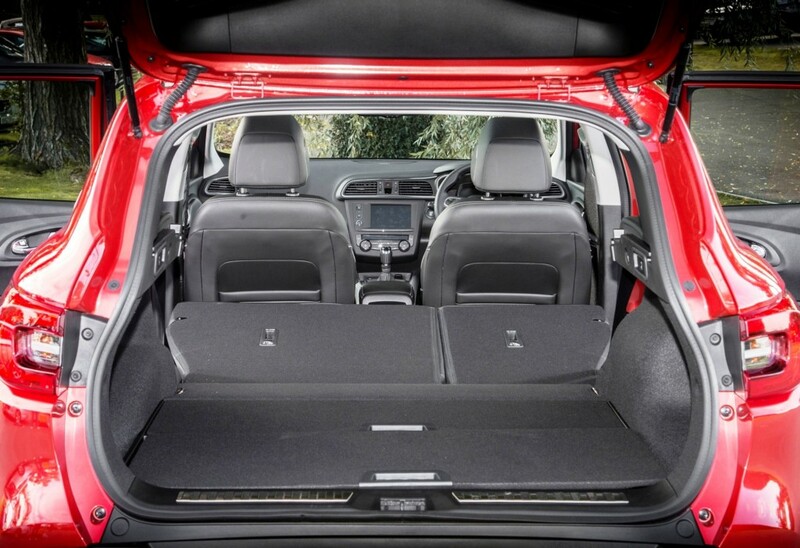 Behind the rear seats is a large boot, bigger than that in the Qashqai, which offers 472-litre of space with the rear seats raised and 1,478-litres with the rear seats folded down. The overall length of the vehicle is 4,449mm (14ft 7in) and the height 1,613mm (5ft 3.5in). With a width of 1,836mm (6ft 3in) there is ample shoulder room and the elevated seating gives good visibility for all passengers. The fascia panel of soft feel textured plastics houses neatly laid out, logical controls and instrumentation. The centrally positioned touchscreen is easy to read although fiddly to use and the menus could be simpler and more logical to use. The info. system even includes a tutorial function on how to drive the vehicle fuel efficiently. There is a chunky gear lever in the centre lower console between the front seats which I found heavy to use and having long arms the gear knob was too high for comfort. Strangely the brake and clutch pedals didn’t offer the same feel and sensitivity as those in the Qashqai and didn’t always make for smooth gearchanges – especially from first to second gears. Whilst the ride was comfortable, even with the large 19-inch wheels, it didn’t quite have the same sharp body control and handling finesse of the Qashqai. It wasn’t so smooth and settled on winding roads and there was some understeer generated during cornering even at moderate speeds. The larger wheels and tyres also created significant road noise on poorer surfaces. As for the engine performance, the 1.6-litre 130hp turbodiesel unit has responsive mid-range urge for overtaking thanks to the 320Nm of torque developed from 1,750rpm. Equally this unit gave smooth performance during stop-start traffic and it proved to be relatively obliging around town, apart from the feel of the not very sensitive clutch pedal. On the open road cruising was effortless with relatively low noise from the engine although there was noticeable wind noise from the area of the front pillar and doors mirrors. The ECO mode was used most of the time which hardly dulls acceleration. The top speed is 118mph and zero to 62 mph takes 9.9-seconds. Officially this model will return 62.8 mpg in the Combined Cycle but on my test driving, cruising on motorways returned 52.2 mpg but overall this dropped to 48.4 mpg with some country roads driving and a few short commuter trips. With CO2 emissions of 117g/km the VED road tax is £0 for the First Year rate increasing to just £30 for the following years. Company car drivers will pay 21% Benefit-in-Kind tax. Insurance is competitive as well with a Group 18E rating. For: Smart, practical styling inside and out, well equipped, long warranty, comfortable ride, spacious with a large boot, low running costs. Against: Not quite as refined to drive as the Nissan Qashqai but better in other areas including price, fiddly and not easy to use touchscreen menus, heavy to use chunky gearlever, no spare wheel – just an inflation kit. 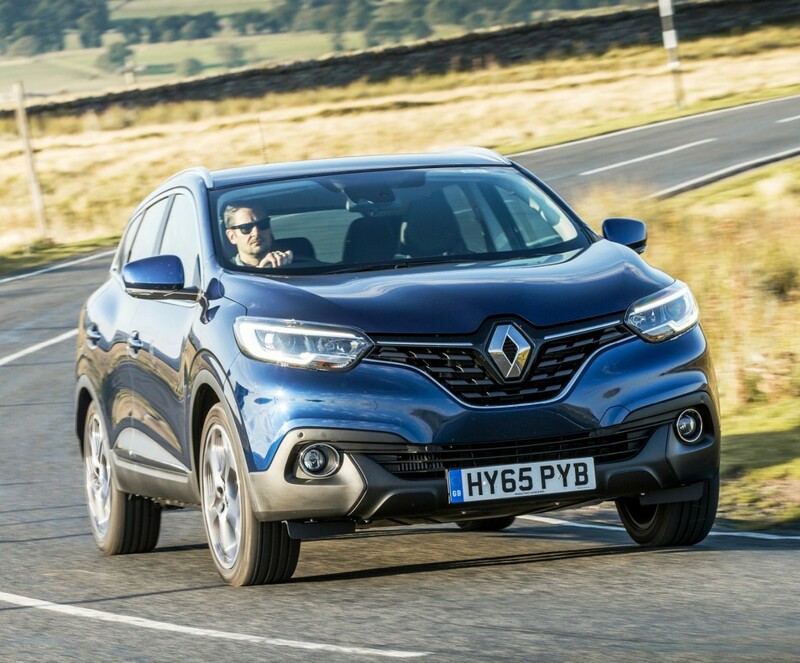 The Kadjar is an important addition to Renault’s range because it gives them an impressive presence in the fastest growing sector of the new car market. Is it better than a Nissan Qashqai? It’s cheaper, has a smarter design inside and out and is almost as good to drive – but not quite. The actual transaction price and quality of the customer’s buying experience in the dealership will be the deciding factor for many buyers. Transmission: 6- peed manual, front wheel drive. CO2 emissions: 117 g/km, VED road tax £0/£30, BIK company car tax 21%. Dimensions/capacities: 5 doors, 5 seats, L 4,449 mm (14ft 7in), H 1,613 mm (5ft 3.5in), W 1,836 mm (6ft 3in), boot/load space 472 to 1,478 litres, braked towing weight 1,800 kg.